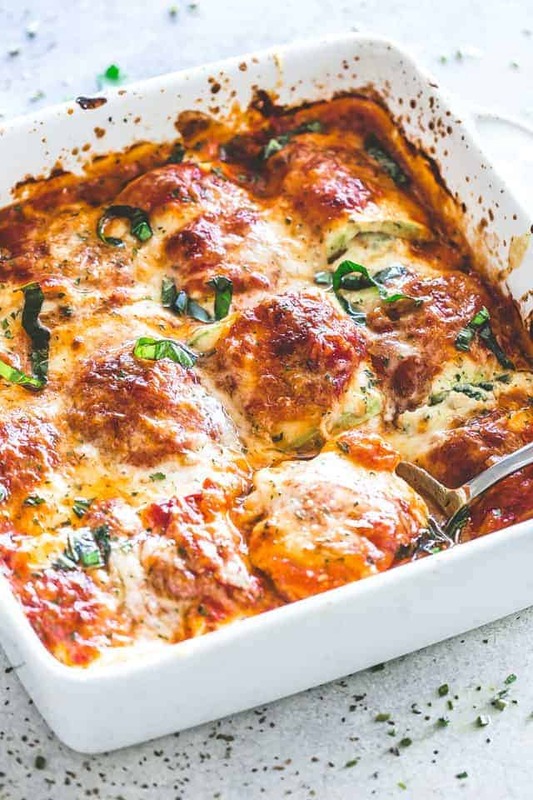 Zucchini slices rolled up around a delicious ricotta filling, baked in tomato sauce and topped with cheese. 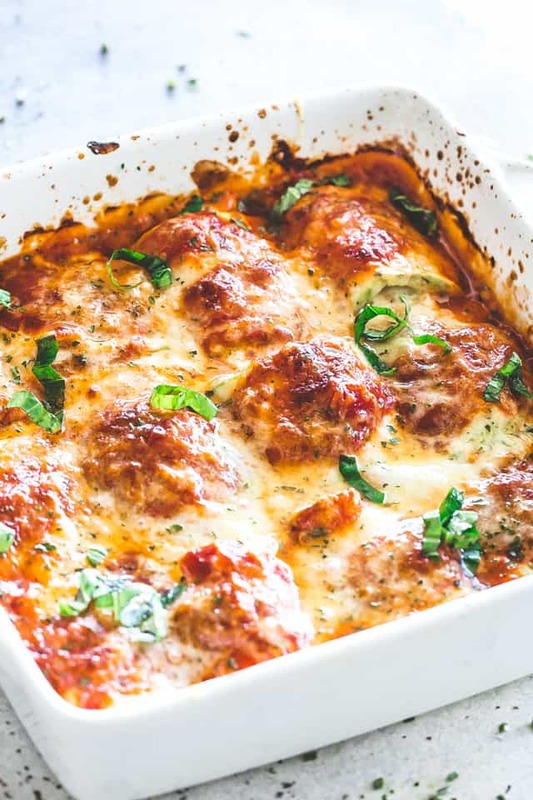 A healthier, low carb lasagna option that’s not only delicious, but also very easy and quick to make. 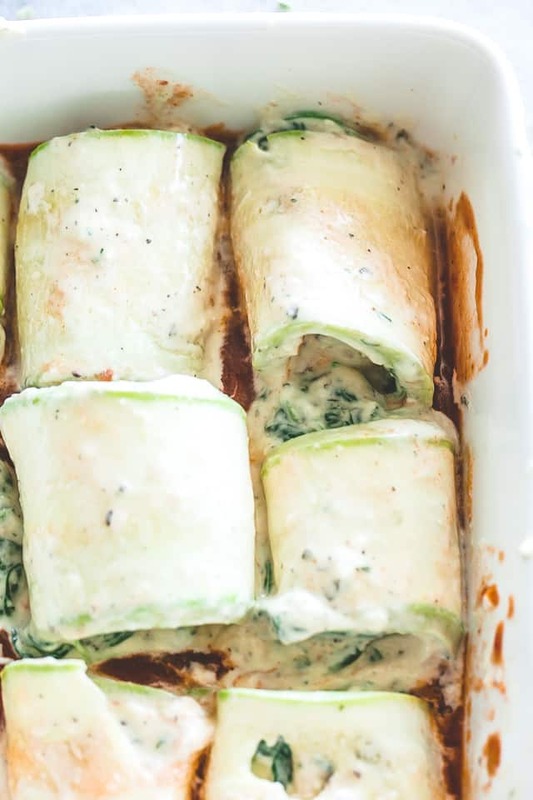 Zucchini lasagna roll ups are a fun twist on traditional lasagna rolls, and they are certainly welcomed by those that are always watching their carb intake. 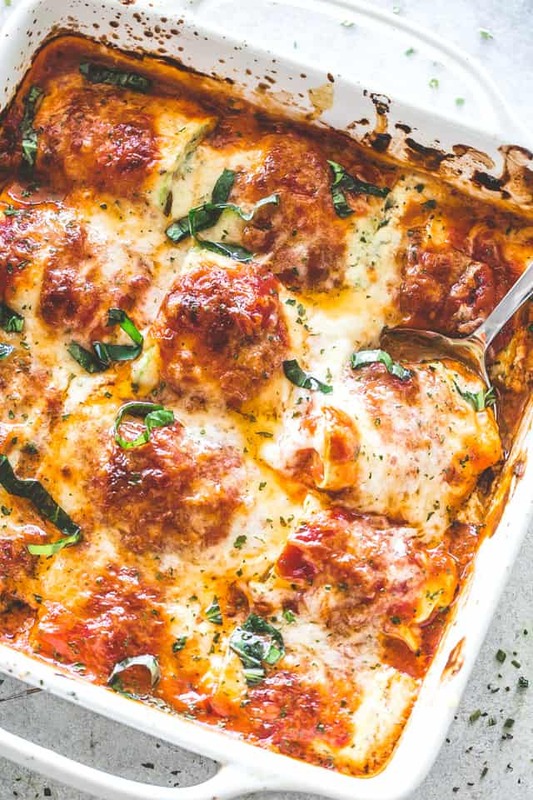 Another bonus is that you can make them in much less time than regular lasagna, making this recipe a perfect weeknight meal for the entire family. Kids included! They won’t mind the green veggie that’s all covered up in cheese. To add, zucchini lasagna rolls are also versatile. 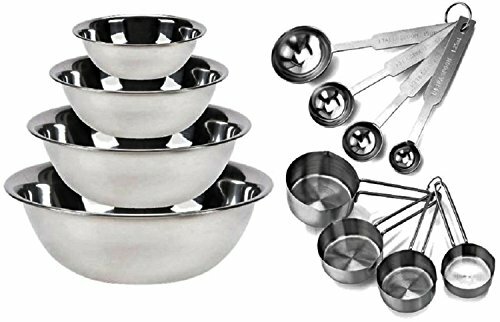 You can stuff them with whatever kind of filling you want, including, meat sauce, mushroom and cheese sauce, a chicken filling, or a vegan filling, and so on. We start by whipping out our mandolin and slicing up a bunch of zucchini, lengthwise. If you don’t have a mandolin, please grab a sharpened knife. Salt the zucchini slices and set them aside while you work on the filling. This step is important for removing the excess water from the zucchini. Next step is making the ricotta filling, which is a basic lasagna filling that includes ricotta, parmesan, eggs, some garlic, prepared baby spinach, herbs and seasonings. Your (our) low carb dreams have come true. Prepare the zucchini roll ups, set in a baking dish, cover with plastic wrap, then aluminum foil, and place in the fridge for up to 24 hours. Prepare the zucchini roll ups, set in a baking dish, cover with plastic wrap, then aluminum foil, and place in the freezer for up to 2 months. Thaw before baking. To remove excess water, please salt the zucchini slices for about 15 minutes before adding in the filling. If your zucchini rolls are unrolling, secure the ends with toothpicks. 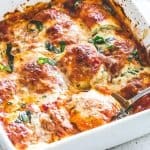 Zucchini slices rolled up around a delicious ricotta filling, baked in tomato sauce and topped with cheese. A healthier, low carb option that's not only delicious, but also very easy and quick to make. 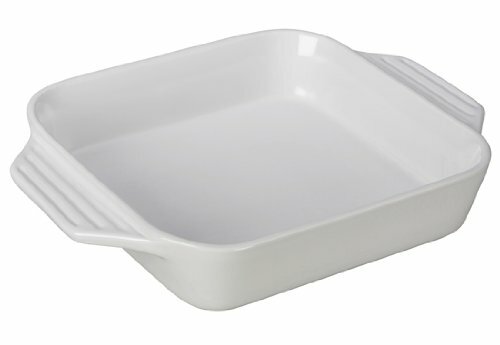 Spread 1/2 cup marinara sauce on the bottom of a 9 x 9-inch baking dish. Set aside. Slice the zucchini, lay them flat on a baking sheet or any other flat surface, sprinkle with salt, and set aside for 15 minutes. Add spinach to the skillet and cook for 2 minutes, or until wilted. Remove spinach from skillet and let cool for a couple minutes. In a medium bowl, combine prepared baby spinach, ricotta, Parmesan, egg, garlic, Italian seasoning, salt, and pepper; mix until thoroughly combined. Lay out the slices of zucchini on a cutting board (or any other working surface), wipe them down, and place a spoonful of the ricotta mixture on top of each zucchini slice. Roll up and transfer to the prepared baking dish, seam-side down. Repeat with remaining zucchini and ricotta mixture. Spoon marinara on top of the zucchini, and sprinkle all over with mozzarella cheese. Bake for 25 to 30 minutes, or until bubbly and the zucchini is tender. Delicious way to use up all my zucchini from the garden! 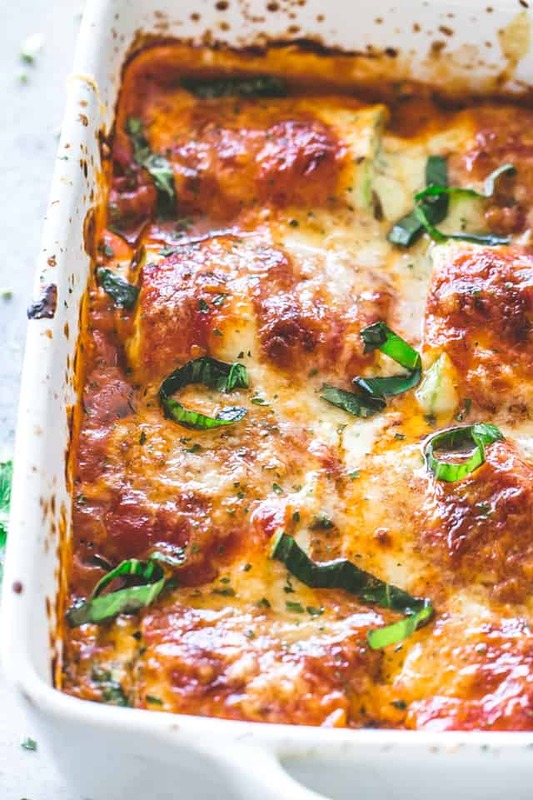 So perfect for satisfying your lasagna craving while not feeling so guilty afterwards! This is a perfect recipe for when the weather is screaming fall but your garden is still chugging out zucchini like no tomorrow! What a great comfort dish! Perfect for summer! Our basil plants are so big and bushy we’ve been eating Italian meals every other night. Pinning this! great good carb for bad carb swap, thank you, also good reminder about removing excess water cause of the water in the zucchini, would have forgot otherwise since I’m used to making this with pasta! Made these for my family tonight. They were delicious!! I love this carb free lasagna! 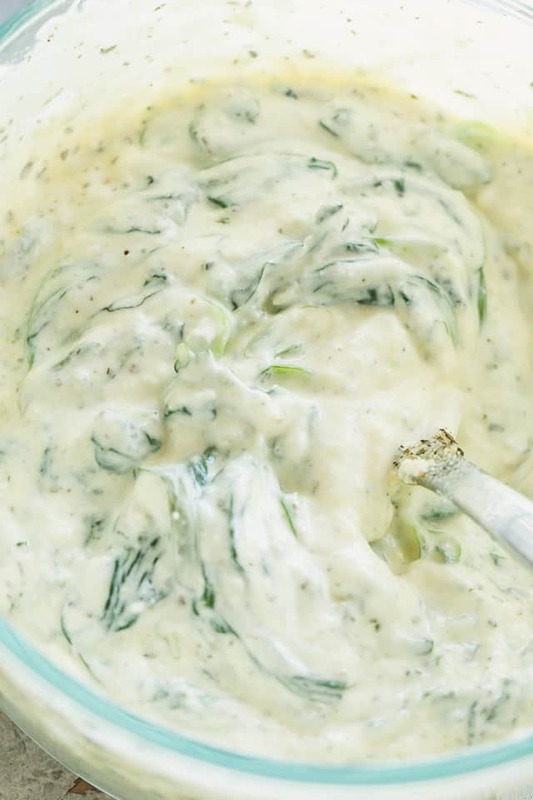 Amazing this zucchini recipe!